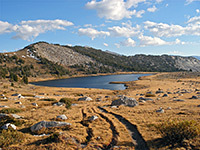 The 2 mile trail to Gaylor Lakes and the Great Sierra Mine begins right next to the ranger station at the east Yosemite National Park entrance, though as it is neither well known nor signposted, most visitors pass by without stopping, en route to the more popular sites around Tuolumne Meadows and Tenaya Lake, yet the Gaylor Lakes are quite easily reached and lie in the middle of a scenic region with sweeping views east and west over many square miles of largely treeless wilderness. The middle of the three lakes can be reached in half an hour, and a round trip to the mine takes from 2 hours though all day could be spent here, exploring the nearby Granite Lakes or hiking further into the mountains beyond the mine. Gaylor Lakes topographic map, Tuolumne Meadows trails. 12 views along the Gaylor Lakes Trail. Parking for the hike is beside the ranger buildings at Tioga Pass, at a small lot also used by hikers heading to Mount Dana. The trail begins with a short but steep climb of 600 feet through pine forest to the top of a ridge, assisted by a few switchbacks but mostly straight up, with the aid of many stone steps. 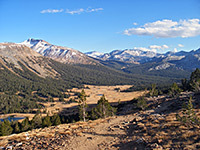 The trees stop at the top of the ridge allowing views up and down the Tioga Pass valley, especially westwards, over Dana Meadows, Mounts Dana, Lewis & Gibbs, and the Kuna Crest. The far side of the ridge slopes less steeply down to a large expanse of open, grassy land dotted with white granite boulders, at the edge of which is the first of the Gaylor Lakes - the middle one. The trail descends through a thin patch of trees to the lakeshore then bends away to the north, climbing gently alongside a small creek towards the upper lake. The horizon at this point is formed by a high granite ridge to the west, distant wooded slopes to the south and the rockier west face of Gaylor Peak to the northeast; the lower lake is out of sight though easily reachable by a one mile walk southwest across the flat grassland. 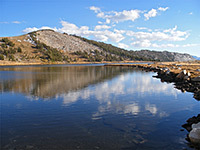 The smaller though more scenic Upper Gaylor Lake is situated in a granite bowl beneath the stony west slope of Gaylor Peak. The now less-used trail passes close to the shore and ends with a short, steep climb to the site of the Great Sierra Mine, marked today by several stone cabins, tailings piles and unfenced shafts, some deep enough to contain a permanent pile of snow. The rocks hereabouts are jagged, reddish, partially metamorphosed granite, covered in places by windswept dwarf pine trees, and the scenery here is altogether quite different to most other places in Yosemite. On the far side of the mine workings, the land rises to a small rocky ridge, the top of which affords nice views over Tioga Lake and down Lee Vining Canyon. 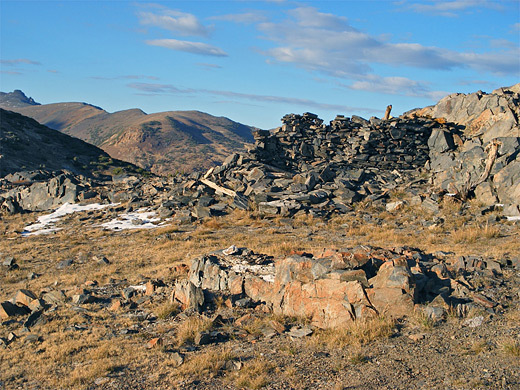 The mine and the nearby village of Dana were established around 1878 after discovery of small amounts of silver nearby but the site was abandoned within 15 years.